Is the Winter Sky Brighter? Twinkles ~ How Many, Why? Find the New Year's Star! This Section Is "On Sabbatical"
Three Seasons of Stars Twinkle! The Northern Cross Stands Upright in the Christmas Season! Shown around 9:30pm on December 15 for mid-northern latitudes. Look for these constellations at 7pm any night during Capricorn. Is the winter sky brighter? Yes, for two reasons. The first is because there are actually more bright stars in our winter sky than in other seasons. About half of the 25 brightest stars in our sky are visible in the winter, a higher proportion of these bright stars than in any other season. The Winter Triangle and The Great Winter Hexagon are made up of some of the brightest stars in the heavens. The second reason has to do with cold air. Note: This image was created in 2002. Saturn is not within the Winter Hexagon now, nor is any other planet. Some of the brightest stars form a large and easily found pattern in the winter sky of Earth's Northern Hemisphere. Dubbed the Winter Hexagon, the stars involved can usually be identified even in the bright night skies of a big city. Sirius is the brightest star in the heavens, Capella is the sixth brightest, Rigel and Procyon are the seventh and eighth brightest stars. Aldebaran is the fourteenth, Pollux is the seventeenth and Castor is the twenty-third. And right in the middle of this geometric gem is the red-giant Betelgeuse (the shoulder of Orion), the ninth brightest star. Imagine the Winter Triangle: See a line drawn from Betelgeuse to Sirius to Procyon and back to Betelgeuse and you have an equilateral triangle! Note: Look closely below Betelgeuse and above Rigel to see Orion's three-starred belt and the sword, which hangs from it. To the right of Aldebaran you'll find the blue-white Pleiades star cluster. How many stars can we see with the naked eye? Since we can only view one half of the sky at a time, the maximum number of stars we can actually see with the unaided eye under ideal conditions is only between 2,500 and 3,000 (6,000 for the entire sky). In fact, it is said that one could count them all in a matter of a few hours! Taking into consideration the light pollution of our cities the number drastically drops. When we casually Look Up on any night, we do not see "thousands and thousands" or even "billions and billions" of stars in the sky. We are lucky, if we can see hundreds at any given time. Using geometry and a toilet paper tube it's possible to estimate the total number of stars visible to the unaided eye at any one time! One of the ways you can tell a bright star from a planet is that planets generally don't twinkle, yet stars seem to twinkle, or change their brightness, all the time. In fact, most of the stars and all the planets are shining with a steady light. So why the twinkle and no twinkle? It has to do with turbulence and apparent surface size. Turbulence, the movement of air in the Earth's atmosphere, causes the point-like image of starlight to shift around and fluctuate in brightness and color. This means that some of the light reaches us directly and some gets bent slightly away as it travels from the distant star through the atmosphere down to us on the ground. To our eyes, this makes the star seem to twinkle. Because planets appear as small disks, not points, the shift amount is only a small percentage of their size. As a result, "twinkleness" is absent. You will notice that stars closer to the horizon will appear to twinkle more than other stars. This is because there is a lot more atmosphere between you and a star near the horizon than between you and a star higher in the sky. Mercury, which stays close to the eastern and western horizons and is point-like, is the only planet that twinkles, flashing a bright yellow color. Go out some night soon and check it out! Look Up! Our Sun is a million-mile-wide cool yellow star. Sirius is almost twice as wide and a very hot white star. The New Year's Star is Sirius, the brightest star in the night sky. Every New Years Eve at midnight, Sirius reaches its highest point in the sky directly on the meridian, known as its zenith point. It's as close as it gets to your crown chakra (the top of your head). No matter where you live, just look due south and up to see this dazzling star heralding in the New Year. Star maps If you miss it at New Years, you can still see Sirius in this location through the first week of January. Find Sirius anytime of the evening by Navigating with Orion. 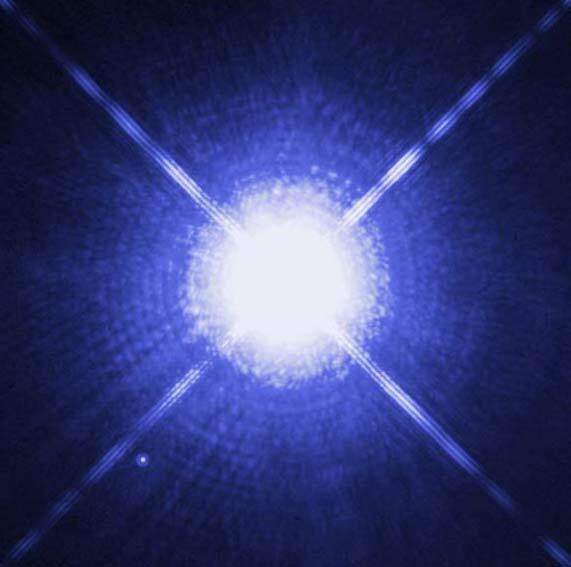 BTW: When we look at Sirius we see the light that left it 8 1/2 years ago! The Ageless Wisdom teaches us that the energies and powers of this star are instrumental in our creation and in the establishment of the guiding forces of our planet and the mysteries of initiation. It has been referred to as the Christ Star. It is also said that a sacred planet is responsive to the life of Sirius. What the Soul is to our personality is what Sirius is to our Solar System. For this reason Sirius is known as the God Star. It is also known as the Dog Star, for it is the brightest star in Canis Major. The Sirius system is directly "upstream" of our solar system within the galactic arm of our Milky Way Galaxy. Because of this, we now know that the polarized energies of Sirius do indeed wash over us. Modern science is yet to discover if this vast current of highly charged particles affects solar activity or life on Earth. By coming directly towards us, Sirius creates an axis of rotation with Earth relative to the stellar background. Because of this, of all the stars in the sky, only the annual heliacal rising of Sirius exactly matches the length of our solar year, 365.25 days. These Sirian forces can aid in the service of those who are spiritually attuned. If you are one of these people, just open your crown chakra and allow the evolutionary energies to flow in and take hold. May only the Greatest Good come forth for all of us this New Year! The Earth's orbit is not a perfect, sun-centered circle therefore our distance from the Sun varies throughout the year. In early July when the Earth is at aphelion the Sun is at apogee, far away from our planet, at its most distant point in Earth's orbit; in early January when the Earth is at perihelion the Sun is at perigee, near our planet, at its closest point. The above image by Anthony Ayiomamitis of Athens, Greece shows how the apparent size of the Sun varies at these two times of the year. Earth and Sun are at their closest on January 3, 2011 at 11:00am PST (19:00 UT). In fact, every January the Earth is at perihelion, the closest to the Sun for the year, and in July it is at apehelion, the farthest away from the Sun for the year. On January 3 we will be only 91.4 million miles away from the Sun, which is 3 million miles closer than when our Earth is at aphelion on July 4, 2011 at 8:00am PDT (15:00 UT). We are so close to the Sun in January that it can appear 7% brighter than it does in July! So why is it colder in January and hotter in July for the Northern Hemisphere? What's the weather like in the Southern Hemisphere right now? The tilt of the Earth plays a big role in answering these questions. Here's a fun and simple explanation ... with the following disclaimer!! and colder winter than the other? You might expect northern summer to be cooler because it occurs when Earth is farther from the Sun. Not so, explains Roy Spencer of the Global Hydrology and Climate Center. "The oceans and land on Earth are not evenly distributed around the globe. The Northern Hemisphere has more land; the Southern Hemisphere has more water. This tends to moderate the impact of differences in sunlight between perihelion and aphelion." 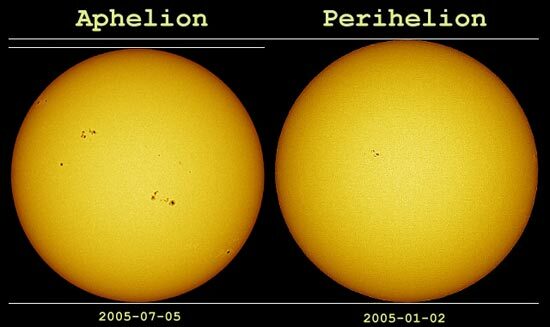 Here are a few more Earth/Sun facts as well as a review of perihelion and aphelion. Here's a year to year chart of Equinoxes, Solstices, Perihelion, and Aphelion. BTW: If you have trouble remembering the difference between perihelion and aphelion, an old astronomer's trick is to recall that the words "away" and "aphelion" both begin with the letter "A". within us be our greatest gift to each other.